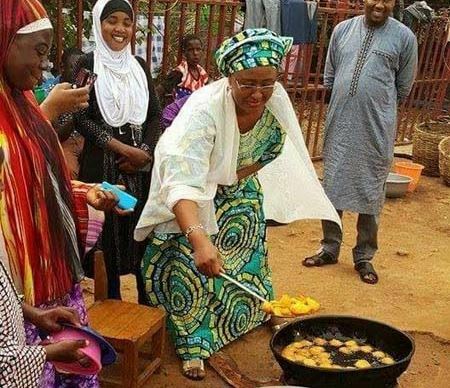 The wife of the President, Mrs Aisha Buhari, has urged Nigerian women to acquire skills that would facilitate their financial independence and contribute to the welfare of their families. Mrs Buhari said this in a statement made available to newsmen on Wednesday by her Director, Information, Mr Suleiman Haruna in Abuja. According to the statement, the wife of the President said this when she flagged off the training of 1, 000 women in different vocational skills on Wednesday in Bauchi State. The skills acquisition programme was organised by the Future Assured initiative, a pet project of Mrs Aisha Buhari. Newsmen report that the programme has 1, 000 beneficiaries consisting of women and youths selected from 20 Local Government areas of the state. Mrs Buhari, who was represented at the event by Mrs Hadiza Abubakar, wife of Bauchi State Governor, said women must live-up to expectations as mothers and acquire entrepreneurial skills. “This training is testimonies of our commitment to helping women attain self-reliance and a fulfillment of our promise to spread empowerment among Nigerian women,” she said.